This past December, Phoenix Labs revealed that they would be bringing their co-op action-RPG, Dauntless, to consoles sometime in 2019. They teased at the time their vision of "One Dauntless," where the game would support full cross-platform play and progression. It seems that they will achieve that vision thanks to Epic's recently revamped Games Store. Cross-platform progression is a major selling point these days as players find themselves shifting between different platforms depending on a variety of factors (e.g., kids on the TV, or partner using the computer). Being able to pick up and play regardless of what console/platform you're on is a great situation. More and more players, too, want to be able to enjoy games with friends without being tied to a specific console or the PC, so cross-platform play is also an ideal scenario. Despite the way the "Save the World" mode of Fortnite has, to some degree, fallen by the wayside in favor of the far more popular Battle Royale, it's hard to ignore the impact that PvP mode has had in shifting things towards that direction. For now, Dauntless is still using its own launcher and on the PC only. Sometime this year, though, it will be closing down that launcher and shifting entirely to the Epic Games Store. Existing players will not lose any progress during this migration and will just have to tie their Phoenix Labs account to their Epic Games account, if they have one, or make a new one and then link. In the official FAQ they've got over on their site, Phoneix Labs is recommending players do this sooner rather than later to secure your desired username, but they also state that there's no firm deadline for taking this step. Presumably, once Dauntless makes its way to consoles (possibly the same day that the migration to the Epic Games Store occurs? ), then everything will be linked up so you and your buddies can team up and hunt Behemoths regardless if you're on PlayStation 4 and they're on Xbox One or PC. At some point, the game will be coming to mobile platforms and the Nintendo Switch, too! 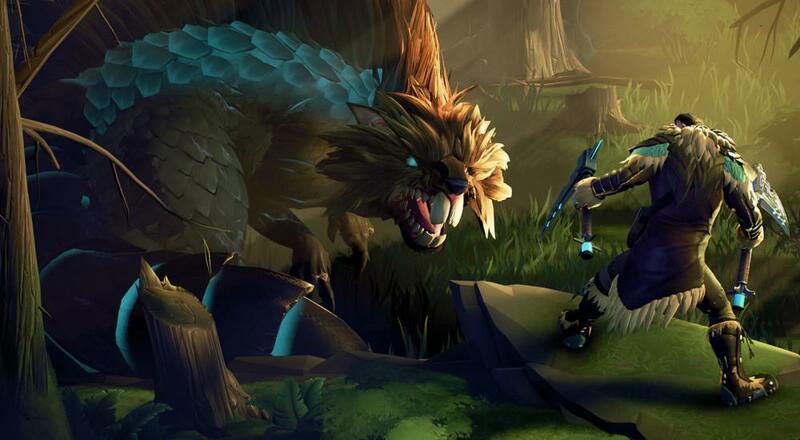 Dauntless is currently available on PC only and supports four player online co-op for when you go out to hunt Behemoths. It is in an "Open Beta" and is also free-to-play. Season 2 of their "Hunt Pass," an in-game system that gives you rewards based on completing certain bounties/objectives, kicked off last week, so it's a good time to hop in and start hunting. No official date has been announced for the switch to the Epic Games Store, but it should be coming to the PlayStation 4 and Xbox One sometime this April. It will then be headed to the Nintendo Switch and mobile platforms sometime 2020. Page created in 0.4583 seconds.